I'm sure that reference has been made before. No, but really, listening to this band is like jumping, hopping, leaping, falling into a sound. No word describes their sound more than oceanic. 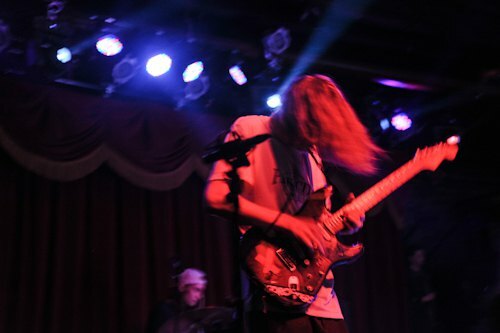 So, listening to Brooklyn's DIIV is like taking a bath- closing your eyes and allowing yourself to be clothed in silky waves of reverb. 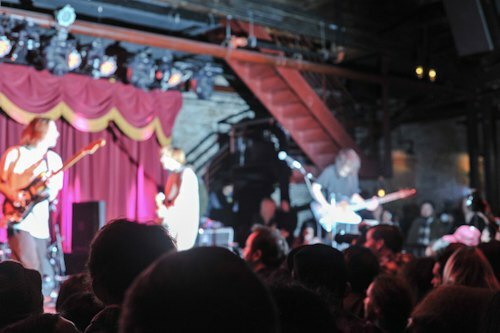 If that metaphor holds, I was bathing with a few hundred people last Sunday while DIIV took the stage for a free show at Brooklyn Bowl. 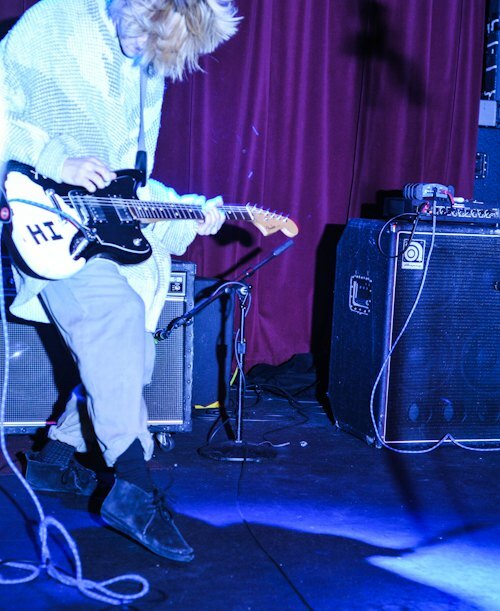 If you haven't heard of this magical band DIIV (formerly known as "Dive" and consistently pronounced that way) do yourself a favor and stream their album, Oshin, on Spotify. It's an immersive record- one full of soaring optimism and carefully plucked tranquility, peek around corners to reveal ominously dark melodies. All these spacey melodies driven by a robust drum sound driven by punk rhythms that somehow meshes perfectly. 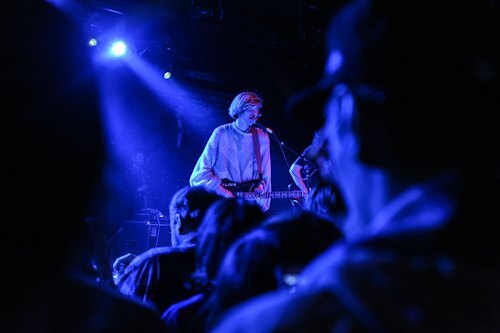 One thing that will strike you, especially seeing the band live- is that diiv's founder, writer and singer, Cole Smith, is not actually the main voice of the song. That part goes to his soaring guitar, with parts that linger in a rainbow of atmospheric emotion. 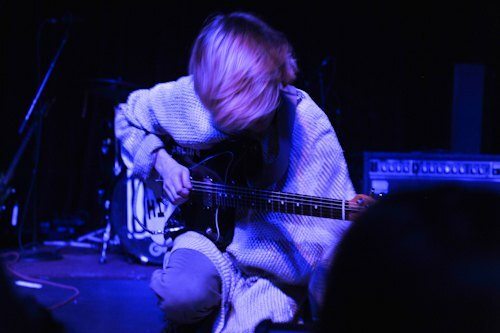 Then comes the second guitar, sometimes piling layers of disorienting noise, sometimes dueling with the first guitar or bass to fold in lush, complex melodies. His sparse vocals ground the sound and lend tangible thoughts to the music, which otherwise would have swept us away long ago. The band took the stage with a passion, determined and seemingly fresh. With good reason; they've been MIA for a while. At one time, you couldn't escape the band. Literally, if you are a show-goer you would have noticed them opening on at least a bill a week every week. They became a Brooklynite's household name, but they were less polished, carrying a less defined sound, a little boring if you asked me back then. Then Smith dissapeared into his bedroom and then the studio to turn these scratch tunes into a full length EP. 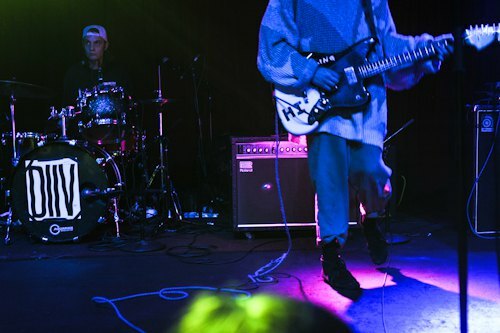 They debuted two new songs, both of which you could tell just by hearing that they will need a proper listening to. With headphones. Alone. Whenever they release a 7". Until then, I'll have to make do in my current Oshin, having pressed the "repeat all" button, clearing my mind one track at a time.